Grilled Chicken Salad With Watermelon? It all started with a bunch of inexpensive watermelons. Watermelons are the perfect summer food. They come in their own package. They’re loaded with juice which helps to quench your thirst. They’re low in calories, and you only need a knife to cut them up so you can eat them. More civilized folks might want to consider using a bowl and a fork, but we’re pretty much barbarians when it comes to watermelon. So, one day, while holding a 10 inch chef’s knife and staring at the dwindling pile of watermelons in my kitchen, I thought of the summer salads that are served at some of the fast food chains that feature fresh berries. I wondered why no one made a salad that contained watermelon. That was all it took to get me started on my salad experiment. First, I took some spring greens and baby spinach and spread them onto a plate. Next, I seasoned some chicken with lemon pepper and my hubby cooked it on the grill. We placed the hot chicken onto the bed of lettuce and spinach. Then scattered chopped watermelon, radishes, avocado, and pine nuts onto the plate. The entire thing was topped with a home made lime vinaigrette. It was good. It took a pretty picture, but some of the strong flavors of the spring greens were so strong that they were overpowering the more delicate flavor of the watermelon. The next day, I repeated the same thing for dinner with a couple of changes. Since it’s extremely hot, no one complained. I prepared the salad again, but this time, I substituted an entire head of butter lettuce and part of a heart of romaine for the spring greens. Both of these are more delicately flavored lettuces. Everything else, remained the same. That was all it took to create salad perfection. I have one word to describe it. YUM! My daughter even ate two salads that night. I forgot to put on the pine nuts before I took the picture. They add a delicious crunch to the salad, so don’t forget them. The answer to the question in my title is this. Yes, a grilled chicken salad with watermelon can taste good. Here’s the recipe. I hope you like it as much as we did. Thanks for visiting Patty Cake’s Pantry. 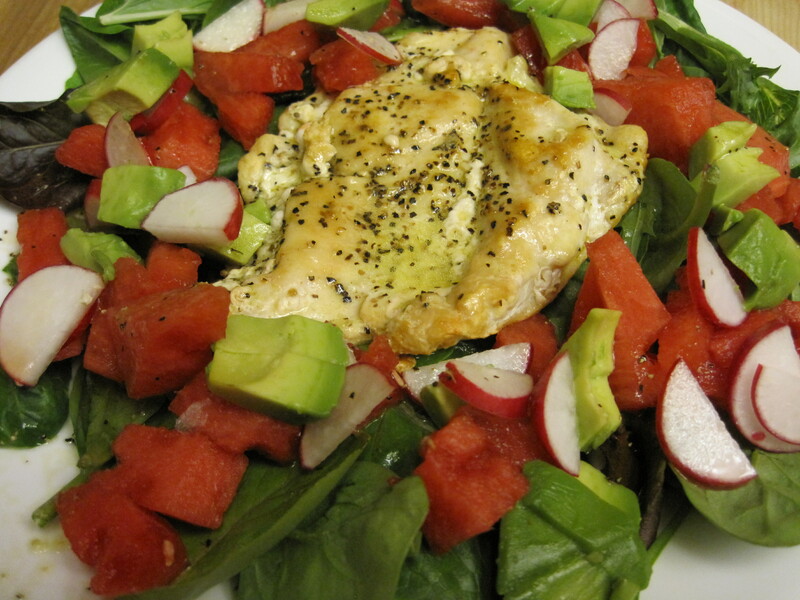 Grilled chicken, and watermelon, on a bed of delicately flavored lettuce make a delicious summer salad. Put olive oil, white wine vinegar and lime juice together with salt and pepper in a sealable jar or container. Shake to mix well. Arrange lettuce evenly among 4 plates. Place one cooked chicken breast in center of plate on lettuce, or you can slice chicken breasts into strips and place onto bed of lettuce. 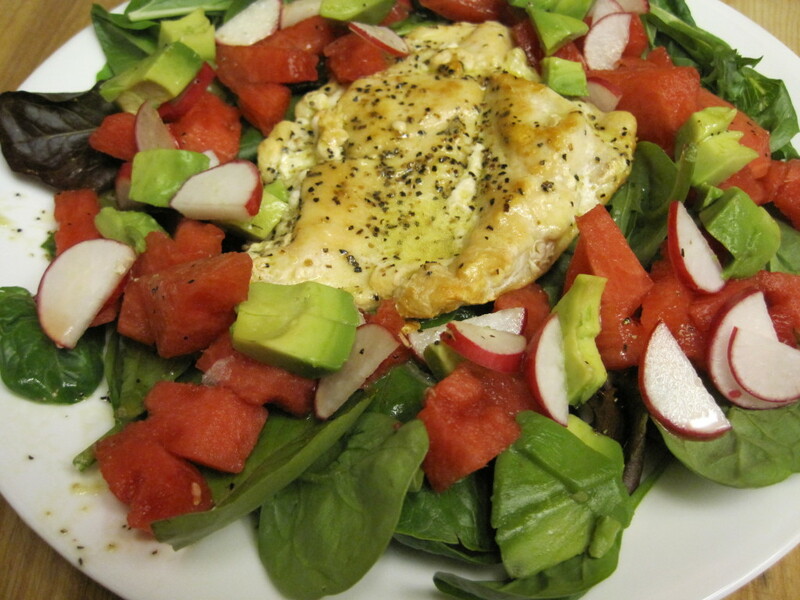 Arrange watermelon chunks, avocado, and sliced radishes around chicken on each plate. Serve with vinaigrette. The vinaigrette is so refreshing, you don't need very much. Generally, no more than 2 tablespoons per salad. Follow me to the weekend potluck.